FRANKLIN, Mass. – In a game where chances are at a premium, with physical battles being waged all over the pitch, and with defenses largely coming out on top, finishing is the difference between taking home the points or leaving with none. Mansfield had one great chance in the box and put it away. Franklin had two chances in the box and both went narrowly off target. 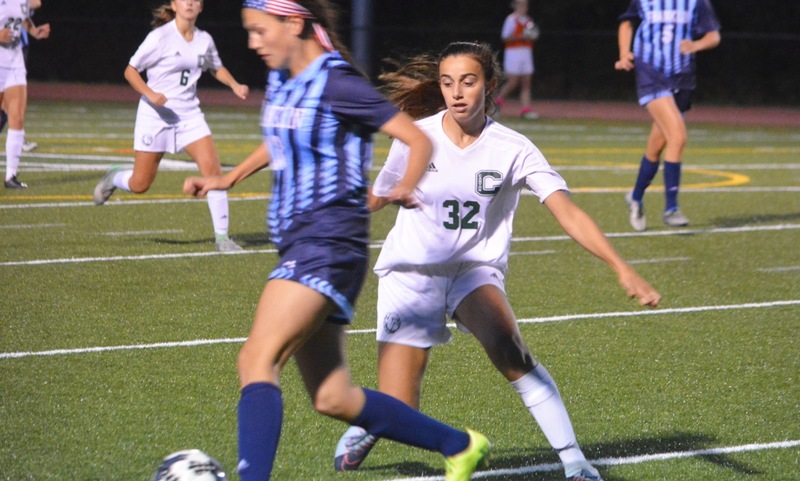 So, on Monday night at Pisini Field, the Hornets walked away with a hard-fought 1-0 win and stayed unbeaten, while, for the second time in a week, the Panthers lost a close game with one of the two defending Kelley-Rex division champions. “It’s such a tough opponent, such a tough place, a great coaching staff, so it’s a good win,” said Mansfield coach Kevin Smith. The first scoring chance of the game fell to the Panthers. Junior Carly Alston sprung senior Hailey Toolin down the right wing and she crossed the ball into the six-yard-box. 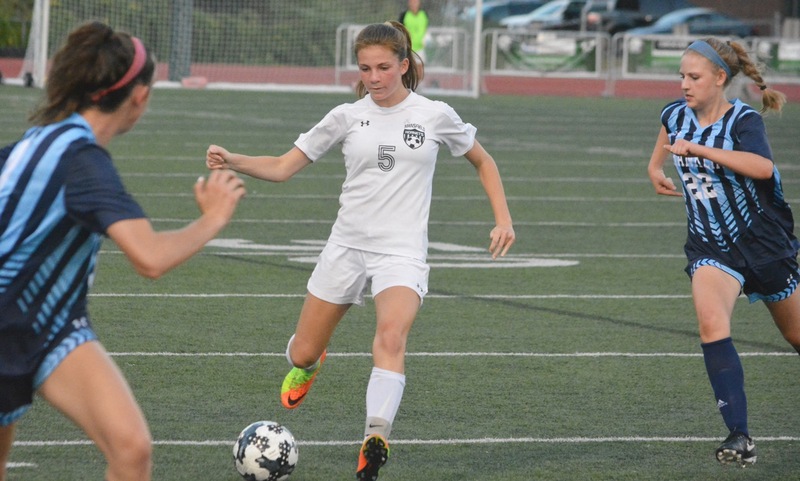 Junior Anna Balkus had made a late run from midfield and got free right in the center but she tried to redirect the ball with her right foot and could only touch it wide. Mansfield took a while to get going in the game. Franklin’s pressing in the midfield was causing problems for the first 15 minutes, but eventually the Hornets started to string passes together and create looks on goal. Melissa Reef had the first shot from distance but it was easily saved by Franklin goalie Breanna Atwood. Bryn Anderson nearly opened the scoring with a free kick from 18 yards out, just to the right of the box. Her shot to the near post was only a foot over the bar. Franklin continued to worry the Mansfield defense with cutting passes in behind. Calen Frongillo was able to slide a pass through the right channel to again get Toolin, who just beat the offside trap, into space but she could only play a ball through the box that was in between a shot and a cross and that Balkus could not get on the end of. Alston also freed up freshman Stella Regan to make a run at goal, but Mansfield defender Emily Vigeant showed off her pace (and long reach) to get a toe to the ball just before a shot could be taken. Franklin’s young forwards were giving the Hornets back line a fight, but Vigeant and fellow senior Mikaela Maughn were solid throughout. In the 24th minute, Mansfield struck. A giveaway at the back gifted possession to Steph Kemp in the attacking third and she quickly played the ball out to the left toCassidy McMahon. The duo played a quick give-and-go to isolate the last defender and get McMahon free on goal and the senior picked the bottom corner with a cool finish. Mansfield had two chances to double the lead in the opening five minutes of the second half. Anderson sprayed a pass out to McMahon on the left wing and she squared the ball into Kemp inside the six, but the senior forward could not get the right contact and it was an easy save for Atwood. Anderson again played provider shortly after to set up Sydney Mulkern, but her chipped shot went over the bar. Just two minutes later, Franklin had another golden opportunity to get on the board. Sophomore Sydney St. Marie got space to attack down the left wing and she played a perfect low cross into the middle to pick out Balkus, but her side-foot effort was again just inches wide of the bottom corner. Kemp nearly added a second for Mansfield in the 53rd minute only to be denied by Atwood. After making a tackle on the edge of the box, the forward found room to unleash a shot that looked destined for the top corner, but the keeper was able to get fingertips to it and tip it around the bar at full stretch. Franklin continued to push until the final whistle, with the physicality from both teams ratcheting up as the seconds ticked down. In the end, Mansfield keeper Caty DeMassi made a couple of routine saves, but was well-protected by the defense in front of her and the Hornets headed home with the two points. While disappointed to not come away with a result, Geysen was still pleased with the effort of the Panthers against one of the league title favorites. Mansfield (4-0-1) will next travel to Milford on Friday afternoon, while Franklin (2-2-0) will travel to Stoughton. FRANKLIN, Mass. – It only took three and a half minutes for #14 Franklin to get its first goal on Friday night at Pisini Field, and the Panthers never looked back en route to a 4-2 win over #19 Brockton in the first round of the MIAA Tournament. Following a miscue by the Brockton goalie, the ball ended up at the feet of Miranda Smith and she capitalized, putting it in the back of the net to give Franklin a 1-0 lad. Ten minutes later, Anna Balkus scored off a feed from Molly Duncan to give the Panthers a 2-0 advantage. “The first half when the first group was in there, they moved the ball really well, and they had the defense moving and they made their own breaks,” Franklin head coach Tom Geysen said about Franklin’s quick start. In the 28th minute, Brockton saw their first scoring chance of the game, but their shot off a free kick was saved by Cat Robbins, who had seven saves on the night for the Panthers. In the 33rd minute, Emily Mastaj found Sydney St. Marie cutting to the net, and St. Marie buried her shot to put Franklin up 3-0. One of the keys for the Panthers was their crisp passing all night, which set up numerous scoring chances and helped them hold the possession advantage. “[Moving the ball] was specifically what we were trying to do, to move the ball, to get the kids to move when they gave up the ball, and the constant movement with and without the ball is tough to cover if you’re doing it right, and in the first half I thought we did it really well,” Geysen added about his team’s ball movement. In the second half, both teams saw scoring chances early, as Franklin’s attempt to extend their lead was denied on a save by Brockton goalkeeper Tory Viola-Laughery in the 43rd minute. Five minutes later Robbins was equal to the task, fully extending on a dive to make a save to keep the Boxers off the board. In the 52nd minute, Smith looked like she had her second goal of the night, but another beautiful save by Viola-Laughery kept the Brockton deficit at three goals. Franklin finally broke through for their fourth goal in the 64th minute, as Duncan found Jess Kroushl streaking downfield, and Kroushl scored to put the Panthers up 4-0. Just two minutes, Brockton got on the scoreboard when Madison Hendrigan capitalized on a penalty kick to cut Franklin’s lead to three goals. With the game winding down, senior Kyla Cullors scored for Brockton to make the score 4-2, and that’s where it stayed until the final whistle. With the win, Franklin (10-7-2) moves on to play Hingham (16-1-1). The Harborwomen have won three straight D2 State titles, and are looking to go on a run in their first year as a D1 team. They come in on a 15-game point streak (14-0-1) in which they’re outscoring opponents 60-8. “We’re going to have to play very, very well to have any opportunity to beat them, but we’ll show up and we’ll do what we need to do,” Geysen added about the Panther’s upcoming opponent. Franklin and Hingham will play Sunday night at 6:00 PM in Hingham. MANSFIELD, Mass. – While it is only about a third of the way through the league campaign, Monday night’s meeting between unbeaten Mansfield and Franklin at Alumni Field was an opportunity for one of the Kelley-Rex’s perennial powers to grab a slim advantage at the top of the table. It was a opportunity that the defending division champion Hornets would not pass up. 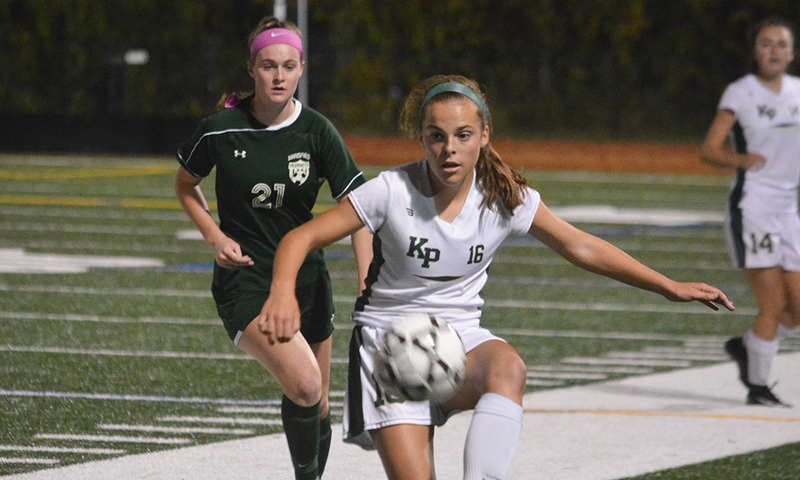 Mansfield dominated large portions of the game, created the majority of the few scoring chances that either team managed, and came away with a 3-0 victory that puts it one game up on the Panthers and King Philip. As expected from a meeting between these two programs, the game was combative and fast-paced, but neither team was able to find space for a shot against two well-organized defensive units (the top two defensive teams in the league). 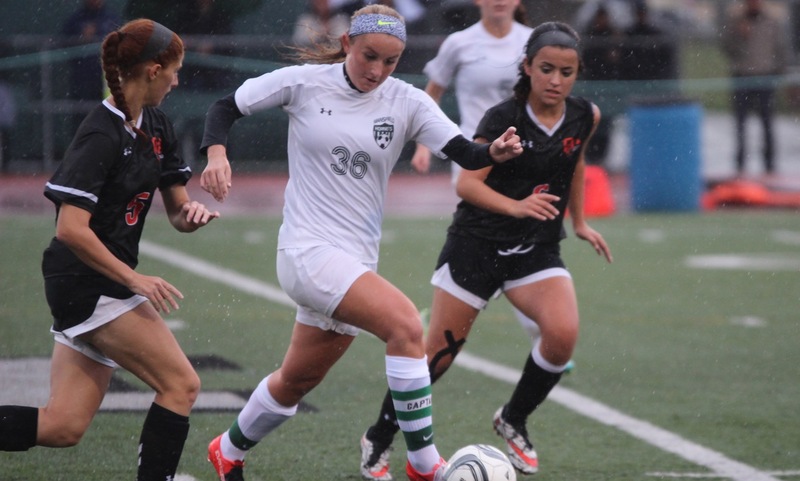 The game changed in the 14th minute when senior Taylor Smith played a long ball out of the back that bounced past the Franklin center backs and into the path of Kerina Geminiani. The junior beat Franklin keeper Cat Robbins to the ball and touched it past her into the open net. The first half was limited in offensive chances for either team. Stephanie Kemp had a shot easily saved by Robbins in the 25th minute, but it was one of only two saves that the keeper was forced into in the game. Meanwhile the Mansfield defense bottled up Franklin midfielder Molly Duncan and held the Panthers without an attempt on goal in the opening 40 minutes. The defense also popped up with a goal for the Hornets. In the 38th minute, Vigeant lined up a 35-yard free kick. Her effort took a deflection off the end of the Panthers wall and bounced past the dive of Robbins for a 2-0 lead at half. Franklin made a change of system at halftime to try and give more of a challenge in the midfield. It seemed to work, as the Panthers got their first shot two minutes after the break when freshman Erin Quaile had her shot saved by Lauren Whitman. Four minutes later, the Panthers nearly got back into the game. Jess Kroushl stole the ball in the midfield and showed off the speed that has made her a track standout to create a chance on the break. Her first effort was blocked and Duncan’s follow-up effort was also blocked by the retreating Mansfield defense. With seven minutes left to play, the Hornets wrapped up the points. Smith played a long free kick into Allee Bezeau in the box and the senior forward flicked the ball across goal to the back post. Bryn Anderson ran onto it and calmly finished with one touch. Kroushl gave the Panthers one more chance to ruin Mansfield’s clean sheet but her breakaway with two minutes remaining was stymied by a sliding Whitman, who managed to get a toe on the ball. Smith was happy to get the lead in the division, however slim it may be. Mansfield (6-0) will get another top of the table test on Thursday when it plays host to second place King Philip. Franklin (5-1-1) will also be back in action on Thursday when the Panthers host Attleboro. FRANKLIN, Mass. – Franklin head coach Tom Geysen admitted he had concerns about his defense coming into the season, especially after graduating two Hockomock all stars. But in its first test of the season, and a tough one at that, the Panthers passed with flying colors, earning a 3-0 shutout over visiting North Attleboro. Junior Grace Gallo anchored the center of the defense with senior Molly O’Reilly and junior Madison Stewart on the outside. While North was able to register 10 shots, only two were true tests for keeper Cat Robbins. “It was a good win, we’re young as far as experience goes and I thought we would be a be a little thin in certain areas but some kids stepped up a bit today that I wasn’t really anticipating,” Geysen said. It didn’t take long for Franklin to try and use its speed to get in behind North Attleboro’s back line. Just five minutes in, after a long ball was spilled by North’s keeper, Miranda Smith jumped on the loose ball in the area but had her bid slide wide at the far post. North registered its first chance in the 16th minute when a ball put into the area fell to Big Red senior Aine Mendonca, but her low shot was saved comfortably by Robbins at the near post. The Panthers broke open the scoring less than five minutes later. Senior Molly Duncan gained possession in the midfield, turned forward and played a perfect diagonal through ball to Smith. Smith faked with her right, cutting past a defender, carried to goal alone and tucked her shot in at the near post to make it 1-0. North Attleboro nearly had an immediate response, forcing Robbins into one of her two big saves in the 21st minute. The Rocketeers quickly moved the ball up field before junior Ashlyn Gaulin unleashed a wicked shot from 25 yards out, but Robbins made a leaping save and tipped the ball over the bar. “That’s what you expect from Cat,” Geysen said. “She might not be the greatest athlete in the world but nobody is tougher than her, nobody works harder than her and she anticipates really well. North had one more serious chance just before the halftime break when Mendonca laid a pass off for senior Felicity Monfils but her strike from just outside the area went just over the bar. The Rocketeers carried that momentum into the second half and looked like they found the equalizer less than a minute in. Mendonca served a ball to the far post and Haley Guertin calmly finished her shot from close range, but the ref disallowed the goal, whistling for a foul off the ball. “I’ll be the last person to use an excuse, but to have that goal called back changed things,” said North Attleboro head coach Bill Wallace. “I felt like we came out and were playing really well to start the second half. And then they scored five minutes later so it hurt. But seven minutes after North’s goal was waved off, Franklin doubled its lead. The Panthers took advantage of a quick throw with Smith springing Duncan in behind the defense. North’s goalie came charging out but Duncan calmly carried around her and finished into the back of the net to make it 2-0. The Panthers put the finishing touches on the win in the 69th minute. Junior Hailey Toolin laid a perfectly weighted pass in the area to sophomore Anna Balkus and she placed her shot just inside the post to make it 3-0. North Attleboro had one final chance with just over three minutes remaining when Gaulin turned and ripped a left footed strike from inside the area but Robbins made the diving stop at the near post to preserve the shutout. ranklin (1-0 Hockomock, 1-0 overall) hosts Algonquin on Saturday in a non-league showdown while North Attleboro (0-1, 0-1) will welcome Taunton (1-0, 2-0) to town on Monday afternoon. FRANKLIN, Mass. – Franklin faced perennial Div. 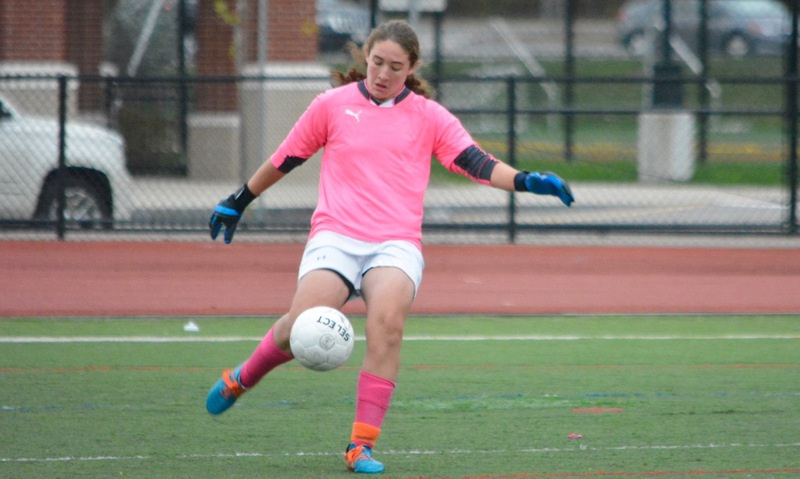 2 power Notre Dame Academy (Hingham) in the regular season finale on Saturday afternoon and it started well for the Panthers, who hit the bar and forced four saves from the NDA keeper in the opening 40 minutes, but the offense stalled after the break. In the second half, the Cougars had an opportunity to hand Franklin just its third loss of the season but standing in the way was Catherine Robbins. The junior keeper stopped a pair of breakaways 15 minutes into the second half that preserved another clean sheet and grabbed Franklin a point in a 0-0 draw at Pisini Field. The Panthers were struggling to get anything going offensively in the second half, losing the ball in midfield and allowing the Cougars to push forward in the attack. In the 54th minute a bad bounce off the turf skipped over the head of Abigail Gipson and allowed Emma Tucker to get in alone on Robbins but the keeper stood tall and got two hands to the shot. Franklin failed to clear the rebound and it was intercepted by Shannon LeVangie who also had a one-on-one with Robbins. The striker opened up her foot and tried to slide it past the keeper to the far post, but Robbins managed to drag her foot and get a toe on the shot to direct it around the post. Franklin tried to snag the full points with a flourish at the end of the game. Playing Molly Duncan up top as a focal point and with Halle Atkinson and Emily Mastaj running the wings, the Panthers went direct with balls over the top and in behind the NDA back line. It worked to create a few chances. Mastaj had the best chance to steal the win when she got free on the edge of the six-yard-box to get a left-foot to Atkinson’s cutback from the byline, but the shot was straight at the NDA keeper. Two minutes later, Franklin had another opportunity after good combination play between Jamie Dragsbaek and Grace Gallo freed up Sabrina Masters but her shot smacked off the football goalposts above the net. “We played three games last week that were all physical games, but that’s just an excuse,” said Geysen about the Panthers inability to get going in the second half. The first half was a very different game, as Franklin had several chances to take the lead and its physical play in the midfield took control of the matchup. Dragsbaek had the first chance off a feed from Duncan but her lofted shot came back off the crossbar inside the opening 10 minutes. In the 13th minute, right back Nadia Havens put a 30-yard free kick on target and forced a diving save from the NDA keeper. Havens would also have a chance off a corner at the half-hour mark but her header flashed inches wide of the post. Duncan was the primary outlet for the Panthers and she had a snap shot on the turn that was again saved by a diving NDA keeper and the rebound fell to Mastaj but she was unable to turn it in. Mastaj would get another chance when she outmuscled the NDA defender to get to Meghan Doherty’s through ball but the shot was saved. Franklin finishes the regular season at 10-2-5 and will not wait the seedings for the Div. 1 South tournament that will come out next week. FRANKLIN, Mass. – On Thursday afternoon at Pisini Field, the Franklin Panthers utilized a three-goal second half to pull away for a 4-0 win over Taunton. The first half was tough for both teams as they both struggled to find their footing. Franklin had the first good look of the half when an Emily Mastaj shot off of a Franklin corner in the 12th minute was stopped on a kick save by Taunton goalie Grace Pimenta. Another Pimenta save on a Miranda Smith shot in the 16th minute kept the game scoreless. Franklin finally broke through in the 27th minute when senior Kathryn Noon found Smith, who converted a header in traffic, to give Franklin the first score and a 1-0 lead. Taunton came fighting back In the 34th minute with their first scoring chance when junior Samantha Tichelaar’sshot off of a corner was saved by Franklin goalie Cat Robbins. In the 39th minute, Taunton again tested Franklin when Tichelaar found herself all alone on a breakaway, but a phenomenal diving save by Robbins preserved the Franklin lead. The remainder of the first half and the beginning of the second half was a possession battle at midfield, as neither team could generate any scoring chances. In the 56th minute, a feed from Calen Frongillo led to a Halle Atkinson breakaway goal, which put Franklin up 2-0. With the momentum now in its favor, Franklin capitalized just one minute later and it was Atkinson leading the way again, as her cross was finished off by Jess Kroushl, putting Franklin up 3-0. In the second half, Franklin’s change in play was largely thanks to their improved passing. “In the first half, we spent as much time passing to them as we did to each other. In the second half, when the kids started to take space before trying to give up the ball, making the defender commit to them, they had opportunities to pass to each other, and it opened up the field,” Franklin coach Tom Geysen said. One of the keys for Franklin was a strong defensive effort, as they limited Taunton’s opportunities, especially in the second half. Seniors Abigail Gipson and Noon were especially important for Franklin, as they prevented Taunton from getting deep in Franklin territory by forcing turnovers. The Tigers’ best chance to score in the second half came in the 62nd minute, when a shot of a corner was deflected away and back into Franklin territory. Franklin (3-1-1) will look to continue its four-game unbeaten streak on Monday at home when it takes on undefeated Mansfield. Taunton (0-5-2) returns home on Monday, where the Tigers look to pick up their first win against King Philip. FRANKLIN, Mass. – Franklin girls soccer kicked off their home opener today at 3:30 against Milford. By 3:31, the Panthers were already up 1-0. Junior forward Miranda Smith stole the ball from a Milford defender and then netted a goal just seven seconds into the game. 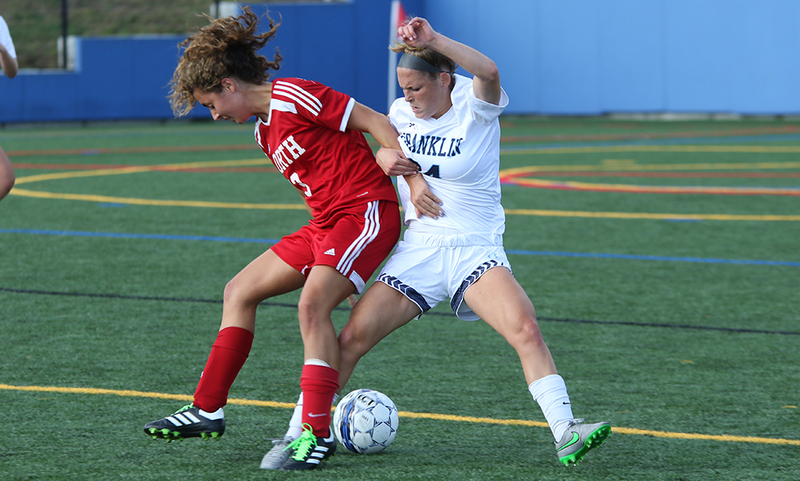 Franklin went on to score three more goals in a 4-0 win over the Scarlet Hawks. After the goal, the teams battled back and forth., Franklin threatened again in the 11th minute, but Milford goalkeeper Olivia Marshall made a save on Smith to keep the score at 1-0. Franklin maintained a slight possession advantage for the rest of the half but Milford continued to battle to keep the game close. Despite jumping ahead to an early lead, Franklin coach Tom Geysen didn’t believe his team responded the way it should have after the early strike. “I’ve been doing this a long time, and a lot of times when you score that early, you kind of get a little complacent,” Geysen said. In the second half, Franklin was anything but complacent, scoring two goals within the first 10 minutes. The first goal was registered when junior Ellie Teixeira found senior Nadia Havens, who deposited in a header in the 45th minute to double Franklin’s lead. 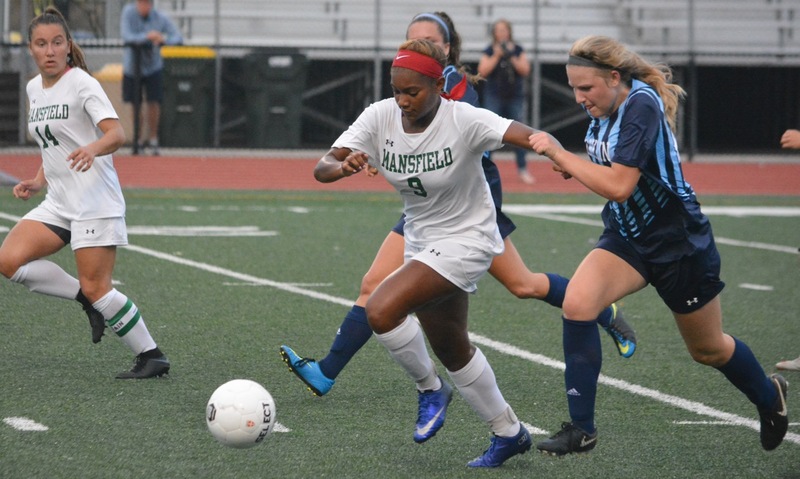 Franklin kept the pressure on from that point and just five minutes later senior defender Abigail Gipson found Halle Atkinson streaking towards the net, where the sophomore then put the ball past the Milford goalie. The final tally of the half and the game came in the 74th minute when junior forward Emily Mastaj connected with Smith, who put in her second goal of the game and sealed the victory for the Panthers. The Panthers received strong defensive showings from junior goalie Cat Robbins who pitched a shutout as well as stout play from senior Kathryn Noon and junior Molly O’Reilly. Franklin girls soccer (1-1, 1-1) will look to make it two straight on Thursday when they travel to Foxboro to take on the Warriors (0-3, 0-3). For Milford (1-2, 0-2), they’ll look to rebound on Thursday when they host Taunton (0-2-1, 0-1).